... Indoor Air Quality should be too. With "State of the Art" Protocols, Equipment, and certified NADCA staff, we are able to find and remove any IAQ threatening bacteria that may be lurking in your building envelop. We videotape all of our work, before and after. A clean indoor environment is crucial in today's workplace. 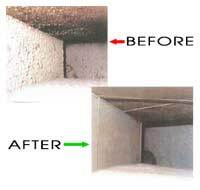 IAQ is extremely important since we spend approximately 90% of our time breathing "indoor air". Unlike outdoor air, indoor air is recycled over and over causing it to trap and build up pollutants. Poor indoor air quality contributes to both short term and long term health issues which can lead to decreased productivity, absenteeism and possible litigation. The impact that IAQ has on building occupant productivity is positive and can be measured. By maintaining proper IAQ, the magnitude of productivity improvement is typically 5-15 percent. Facilities with good IAQ can expect to have reduced absenteeism by up to 40 percent. There is an extremely positive rate of return on IAQ investment. IAQ concerns must be addressed. A healthy building will have a competitive edge in today's market resulting in greater occupancy, increased employee productivity, and energy savings. With labor costs making up a substantial portion of a facility's annual operating cost, it makes sense to focus on improving IAQ as a means of enhancing productivity. Core Mechanical uses a range of diagnostic tools to identify not only the source of IAQ problems but also their magnitude. For example, IAQ monitors are used to measure for an array of parameters and materials, including carbon monoxide, carbon dioxide, relative humidity, air temperatures and air flow rates. Call us today at (856) 665-0636 or contact us via e-mail to get your environment under control with the Indoor Air Quality Experts at CoreMech.